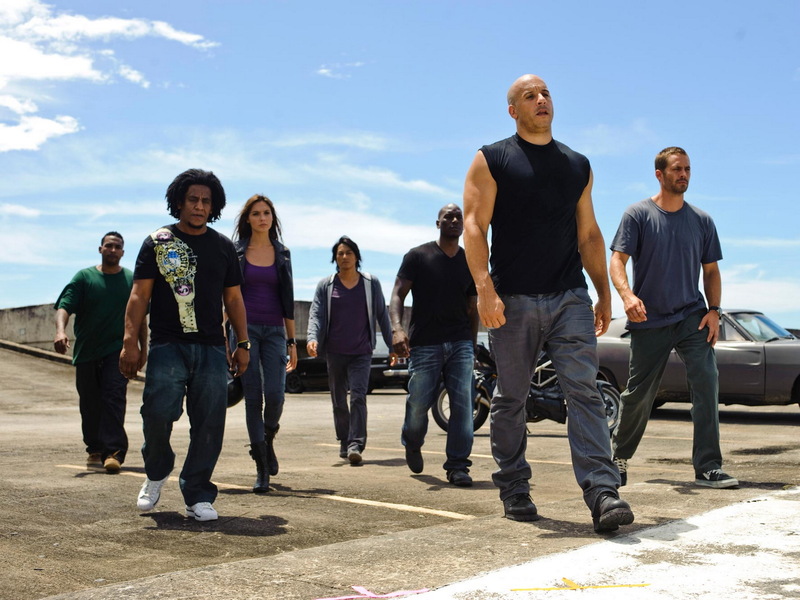 Before we watched Fast Five, we watched all the previous four films to prepare. I’m glad we did, because not only did I enjoy 3 of these 4 movies (Tokyo Drift was pretty meh in my book), but Five basically assumed you’d seen them. Which was okay. It made for good times. And based on Ebert’s review, even if you completely forgot 2 of the movies, it was still pretty enjoyable. What made it fresh and interesting even in the 5th go round, is that this was much more a caper film than a car racing film. In fact, most of the racing this time is implied, but what is there tops anything they did in the previous films. The heist part seems to be an intentional riff on Ocean’s Eleven, right down to the montage sequence where Brian and Dom select their crew, which just happens to be made up of characters from all four of the previous films. Getting to finally see these characters interact was much fun, and I felt that the dude from Tokyo Drift got to especially redeem himself on this run. But the thing I liked most about how they handled the caper part of the story is how instead of just having the thing go massively wrong in one fell swoop, we instead get to witness a dozen little small things that go wrong, and root for our boys as they improvise, which seems to be what they do best. So, if you’re a fan of these movies, well, you’ve probably already seen it since it’s holding on to the top half of the top ten, but if you are a fan of heist movies, you might find yourself pleasantly surprised by the direction this franchise has gone in. And stick around for the end of the credits! Especially if you remember 2 Fast 2 Furious. I can hear the engine being turned over on a sequel already.